We must have watched the one above at least five times. The first time all three of us (Bookworms 1 & 2, plus myself) watched in fear and wonderment. The second time around I couldn't quit laughing, Bookworm1 was laughing and trying to mimic the words he THOUGHT they were saying, and Bookworm2 engaged in nervous laughter. The third time we watched it, we all laughed and then went to go and soak some beans. Of course, all of this ties into a book. I was actually not the one to make the connection because our activity and this particular story. Bookworm1 said we were growing beans, "Just like Mickey and the Beanstalk!" And so we are. Only I would like to keep my feet planted firmly on the ground, thanks, and watch our beans grow without the threat of giants. Of course, once Bookworm1 made the connection for Mommy, we started talking about beans and seeds and other stories which can foster the concept. 1. 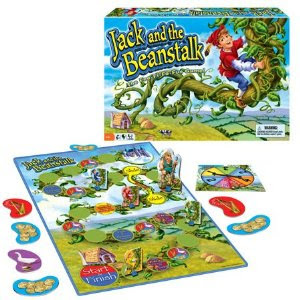 Up to four players can work their way up the beanstalk and back down again, in a quest to collect three treasures: golden coins, the goose that laid the golden egg, and the singing harp. You go up, you come down. 2. There is a giant (of course!) who can also travel down from his castle at the top of the beanstalk to give chase to Jack and recollect treasures. If he lands on your space, then you have to give up one of your priceless possessions. 3. The first player who makes it back down the beanstalk with all three treasures wins the game! You can lose treasures along the way via the giant, as mentioned previously, or by another player being given the opportunity to trade treasures with you, thereby eliminating your ability to form your collection of three treasures too quickly. I thought the game would be simply and easily won, but it ended up that a second trip up the beanstalk was a perfectly valid threat in order to claim the requisite singing harp. Bookworm1 had successfully gathered both the golden coins and goose but was lacking the harp before making it back to the starting position. The game is designed for children ages 5 and up, but Bookworm1, being 3 1/2, understood the concepts and we had no troubles in playing it together. He definitely still needs some adult supervision when playing, but we were able to play against one another without too much confusion (on the part of either one of us!) and so I considered our venture with the Jack And the Beanstalk Game to be a success! Except (!) he is still young enough to play the game literally and expressed some serious concerns about the giant landing on his space. ("What will he DO to me!?") Heh . . . I love literal toddlers in a strange and amusing way! Any bean and sprout books/games/video recommendation for us? Let us know! Um... 3 weeks and no sprouts? I think it might be time to throw in the "trowel." (Ha!Ha!) In the future I recommend wetting a sturdy paper towel. Not dripping but more than just damp. Place a couple of beans on the paper towel and put the whole thing inside a ziploc bag. Tape the sealed bag to a window (being sure to position so you can see the beans). You should be able to see sprouts and roots in a few days. Love your post and now laughing at Stephanies (above) comment.